Grab a cup of coffee, find a quiet space for an hour, and give yourself and your family the gift of getting your personal finances organized for a head start on 2019 planning! 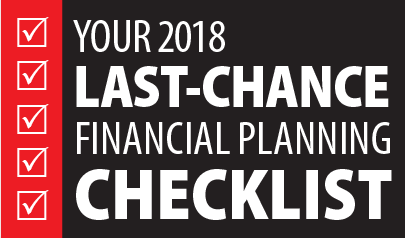 Now is an ideal time to do a year-end check-up of your financial health and update your financial plans. Below is a list of important action items to review. If you have any questions or concerns as you determine key items that impact your situation or need more research or discussion, feel free to call me at 305-751-8855. I will be happy to go over your concerns and discuss possible scenarios for 2018 and 2019 that best meet your tax and financial planning needs. Project 2018 net investment income. Review realized and unrealized gains and losses. Max out 401(k) contributions including catch-ups. Max out IRA contributions including catch-ups. Check the status of all retirement accounts. Get your copy of "Retire Happy: A Simple Guide to Your Next Big Adventure"
Confirm investment goals and strategy. Review the fundamentals of portfolio positions. Review outstanding loans and mortgages. Consider Social Security claiming options. 10 things to consider when planning your financial future. Review costs of current insurance policies. Identify material changes in life, business, or financial circumstances that may require insurance adjustments. Assess your life insurance needs now. 70½: You must begin taking RMDs from IRAs. Instructions for determining your minimum distribution. Review employer’s health insurance plan. Did you refinance your house? Did you add to the family through birth or adoption? Do you have a parent or other family member in need of assisted living? Ensure details about important documents are easy to find. Get your free copy of our "Survivor's Guide: Financial & Legal Document Organizer"
9. REWARD YOURSELF FOR COMPLETING YOUR REVIEW!